JEE Main is a national-level entrance exam for admission into B.Tech and B.Arch/ B.Plan programmes in engineering and architecture colleges across the country. This is one of the most popular entrance exams in India. Every year around 12-14 lakh students appear for JEE Main. JEE Main 2019 participating institutes include 31 National Institutes of Technology (NITs), 23 Indian Institutes of Information Technology (IIITs) and 23 Centrally Funded Technical Institutions (CFTIs). This means as many as 77 institutes of national importance are participating institutes of JEE Main 2019. Apart from these, the JEE Main score is accepted by certain self-financed universities and institutions. Earlier, JEE Main was conducted by the Central Board of Secondary Education (CBSE). From 2019 onward, the National Testing Agency (NTA), the newly formed body, will conduct the exam. Also, the exam will be conducted twice a year, in January and April, giving students an opportunity to improve their score without having to drop a year. Furthermore, JEE Main will be conducted online from 2019 onward. It is not mandatory to appear for the exam both the times (January and April). In case a student appears for the exam both the times, the better of the two scores will be considered for admission/counselling. JEE Main is also the qualifying exam for JEE Advanced. IITs do not accept JEE Main score for B.Tech admission and, hence, students aspiring to get themselves enrolled in IITs will also have to appear for JEE Advanced. A student will be allowed to appear for JEE Advanced only if he clears the JEE Main cutoff. A vast majority of students find JEE Main to be tough and difficult to crack. The number of students appearing for JEE Main increases each year, which also increases the competition. In order to crack JEE Main and get into India’s top colleges, a student requires determination, perseverance and smart preparation. JEE Main is conducted for two papers: Paper 1 (B.Tech) and Paper 2 (B.Arch/ B.Plan). Students preparing for Engineering should opt for Paper 1 and those preparing for Architecture should opt for Paper 2. As mentioned above, the online registration for JEE Main 2019 – January was opened from 1st of September 2018 till 30th September 2018. For the April session, the online registration started from February 08, 2019. The last date to apply for the April session of JEE Main was March 07th, 2019. Candidates can register themselves for the exam only in the online mode. The online application form for April session would be available on the official website of JEE Main – jeemain.nic.in. You can apply for JEE Main 2019 online through the official website of NTA – nta.ac.in or through the JEE Main official website – jeemain.nic.in. You are allowed to submit only one Application Form. Multiple applications of a candidate are liable to be rejected. Step 1: Fill the Online Application Form, choose your Password and note down the system-generated Application Number. You should supply all the details while filling the Online Application Form and you are also required to choose PASSWORD and Security Question and enter your answer to the same. After successful submission of the data, an Application Number will be generated and it will be used to complete the remaining steps of the Application Form and also for all future correspondence. For subsequent logins, you will be able to login directly with your respective system-generated Application Number and chosen Password. Note: You will be able to modify/correct the particulars before the payment of fees. Once the payment of fee has been made/e-challan downloaded, your particulars cannot be edited. For detailed instructions along with the procedure to reset your password, check this out. The date of birth of the candidate should be on or after 1st October 1994. In case of SC/ST/OBC category, the age limit is relaxed for 5 years. A candidate should have cleared his/her class 12 or other qualifying exams in the year 2017, 2018 or appearing in 2019. A candidate is allowed a maximum of 3 consecutive attempts for JEE Main. If you have given the JEE twice and have also skipped a year without giving the JEE, you are not eligible for JEE Main 2019. The candidate should get at least 75% in class 12th examination or should be in the top 20 percentile in their respective boards. The JEE Main accepts all boards under Association of Indian Universities which includes the National Institute of Open Schooling (NIOS) as well. Diplomas recognized by the All India Council for Technical Education (AICTE) also make a candidate eligible for the JEE Main. Note: If you have given the first attempt of your 12th board exam in 2016, but have repeated the exam to pass in 2017, you are not eligible for JEE Main 2019. One correct answer will award you 4 marks and every incorrect answer will lead to a deduction of ¼ marks. No marks will be deducted for questions left unattempted. Each question can have only one answer; marking multiple answers will be considered as an incorrect answer and ¼ marks will be deducted. To start with your studies you need to know the exact structure of the syllabus you need to plan. So here is an outline of the whole syllabus for JEE Main and Advanced 2019. You can click on the links to start practising the chapters. Ideally, you should be viewing your syllabus in the format mentioned above. However, a lot of students find more comfort in having their syllabus class-wise. Mechanical Waves Dual Nature of Matter and radiation. JEE Main 2019 results was declared in the month of February 2019 (for JEE Main January 2019) and the same will be declared on May 2019 (for JEE Main April 2019). We have listed some books that you should definitely have and the books that will help you in specific areas. For more details on the books, read on. 5.How’s Life in IIT like? Tabulated below are all the 8 papers of the JEE Main 2019 January session. Get all the JEE Main April 2019 Question Papers here. Get the Question Papers, Answer Key, Detailed Solutions and in-depth Analysis of all the JEE Main papers for 2014, 2015, 2016 and 2017. Get the best analysis of the JEE Main from IITians and subject matter experts. Download question papers (for all paper codes) for the JEE Main 2016 Offline exam held on 3rd April. Check the tabs for Answer Keys, Detailed Solutions and Analysis! Question Papers for every paper code of the offline JEE Main on 4th April 2015. Click to view/download the question papers for the Online JEE Main exam held on 10th and 11th April 2015. Click to view/download the question papers for the offline JEE Main exam of 2014! Here are the answer keys for JEE Main 2016 Offline Exam all paper codes. You can check out the solutions for the JEE Main 2016 Online exams as every student had a unique paper! Check your scores! Here are Embibe’s answer keys for all paper codes of JEE Main Offline Exam 2015. Embibe’s answer keys for the Online JEE Main Exams held on 10th and 11th April. Get Embibe’s answer keys for the Offline JEE Main Exam of 2014. Solutions for all codes of the JEE Main 2016 Offline Exam. Bookmark this Page! Detailed Solutions for all codes of the Offline JEE Main 2015. Take the Real JEE Exam Now! The solutions for the online exam for JEE Main 2015, held on 10th and 11th April. The JEE Main 2016 paper was easier than in 2015, which should increase the cut offs. However, since more students are going to be shortlisted (2 lac instead of 1.5 lac), the net cut offs will be lower than that of the previous year. 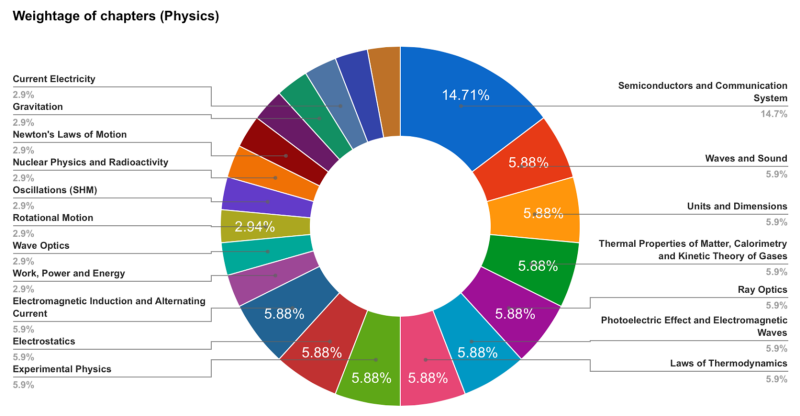 The pie charts for each of the subjects below show how certain chapters have been more important than others in this year’s exam. Moreover, by using Embibe’s Learn Digest Question Pack, students would have gained a leg up during preparation. 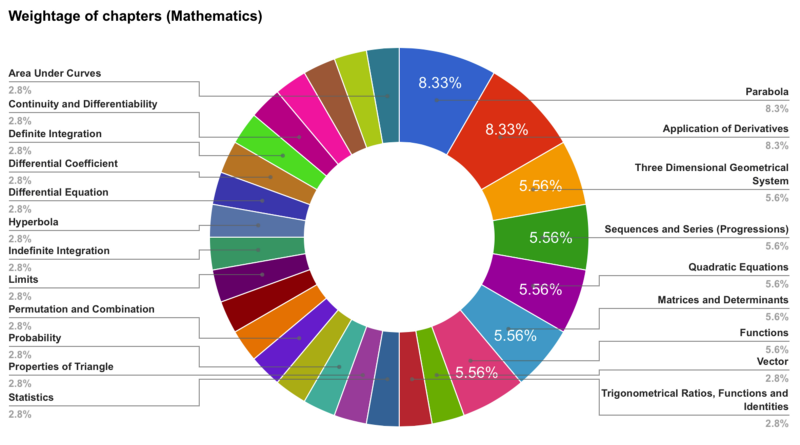 Concepts and questions from 80% of the top 15 chapters in Mathematics were represented in the Digest, as were 66.7% of Physics chapters and 53.3% of Chemistry chapters. Let’s look deeper into accuracy, careless mistakes and time management. We had over 2000 questions on Embibe extremely similar to the questions asked in the JEE Main 2016. The attempts by students on those questions alone were over 5 lac. We compiled the data of these 5 lac+ attempts. We track careless mistakes! These were the important chapters where most students made careless mistakes. This is collected through the data of overtime attempts. Here are the chapters where students wasted too much per question because they didn’t know the fastest ways to solve them. We can take this same analysis even deeper, on to the concept level! For every question you practice on Embibe, we know its difficulty, concepts, and even formulae required to solve it. Clear your weaknesses with Embibe! The main criterion which should determine your decision to go with JEE Main offline or online examination is how comfortable you are with computers and computer-based tests (CBT). At Embibe, you have all the resources that you need to crack the exam. Here, you can give as many JEE mock tests as you want (free of cost), both for JEE Main and JEE Advanced. You can even try the previous years papers to see exactly where you stand so that you can improve in your weak points. The JEE Main 2019 hall ticket/ Admit Card will be released on the official website. On the homepage, click on ‘Admit card’. Counselling procedure will be conducted on the basis of the merit list. For students who appear in JEE Main 2019 both the times, i.e. in January and April, the best score will be considered. The tentative dates for the counselling would be in the first week of July 2019. The counselling is handled by the JoSAA and the entire process is divided into multiple rounds. Each round will have a separate list of selected candidates. JEE Main 2019 Counselling by JoSAA | Eligibility, Procedure, Important Dates, etc. JEE Main seems like a tough exam, but it really is not. Coaching is important, but what’s more important is proper guidance and mentoring. Proper planning, consistent hard work and dedication will definitely lead you to success. Do your preparations, use Embibe for practice, tests and improve your score.